PCMCIA has tripped off many a tongue in recent months owing to an increase in application-specific cards and systems that use the technology. 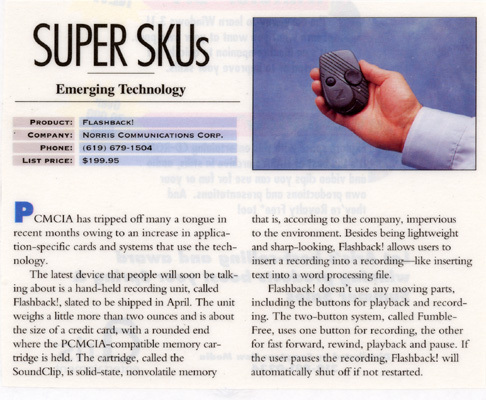 The latest device that people will soon be talking about is a hand-held recording unit, called Flashback!, slated to be shipped in April. 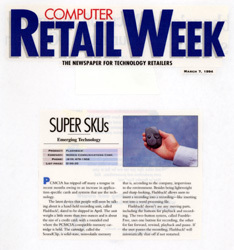 The unit weighs a little more than two ounces and is about the size of a credit card, with a rounded end where the PCMCIA-compatible memory cartridge is held. The cartridge, called the SoundClip, is solid-state, nonvolatile memory that is, according to the company, impervious to the environment. Besides being lightweight and sharp-looking, Flashback! allows users to insert a recording into a recording--like inserting text into a word processing file. Flashback! doesn't use any moving parts, including the buttons for playback and recording. The two-button system, called Fumble-Free, uses one button for recording, the other for fast forward, rewind, playback and pause. If the user pauses the recording, Flashback! will automatically shut off if not restarted.